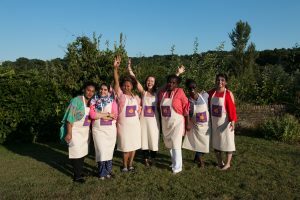 Migrateful is recruiting a project manager to support us with our daily operations, consumer relationship and liaising with our chefs to run our classes and events. Please note: the current start date for this role is January 2019 as we are waiting for funding to come though, although it could be before. If you are interested please email the Director, Jess Thompson with a cover letter and CV at jess@migrateful.org. Create menus with the chefs for the Migrateful cookery sessions. Organize volunteers and facilitators for each class. Liaise with clients responding to bookings, gift voucher purchases and others. Supervise chefs during Wednesday chef training sessions, encouraging proper techniques and correcting as needed. Manage our freelance staff – marketing manager, volunteers and facilitators. Business development – building relationships with corporates who are interested in cookery classes as team building activities. Organised, with a knack for Excel and efficient email correspondence. Proficient in Microsoft Office, Mailchimp and Eventbrite. To be invested in Migrateful’s mission!